Fresh off the press is a paper that takes an innovative look at the national contributions pledged under the Paris Agreement. Under the bottom-up architecture of the Paris Agreement, countries pledge Nationally Determined Contributions (NDCs). Current NDCs individually align, at best, with divergent concepts of equity and are collectively inconsistent with the Paris Agreement. We show that the global 2030-emissions of NDCs match the sum of each country adopting the least-stringent of five effort-sharing allocations of a well-below 2 °C-scenario. Extending such a self-interested bottom-up aggregation of equity might lead to a median 2100-warming of 2.3 °C. Tightening the warming goal of each country’s effort-sharing approach to aspirational levels of 1.1 °C and 1.3 °C could achieve the 1.5 °C and well-below 2 °C-thresholds, respectively. This new hybrid allocation reconciles the bottom-up nature of the Paris Agreement with its top-down warming thresholds and provides a temperature metric to assess NDCs. When taken as benchmark by other countries, the NDCs of India, the EU, the USA and China lead to 2.6 °C, 3.2 °C, 4 °C and over 5.1 °C warmings, respectively. Let me emphasise the central conclusion. 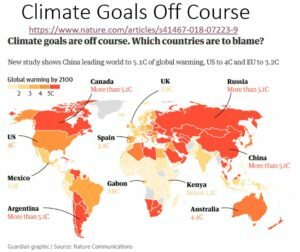 The authors of the paper (Warming assessment of the bottom-up Paris Agreement emissions pledges, Nature Communications, Nov. 2018) looked at all the national contributions and calculated where they stood against five levels related to each nation’s capability. Some were “ambitious”, some were less than “ambitious”. They added them up. The total predicted for 2030 was the same as if all nations had decided to forgo the very least amount of emissions they could get away with. Is human nature predictable? Yes. Does it look as though they will respond to very high New Zealand-inspired contributions? No. Is our faith in the “fairness and justice” of all nations justified? No. Would we be morons to fund our highest possible contribution to fighting the climate? Yes. Are the NZ coalition government’s days in office numbered? Yes. The quantification of national emissions levels consistent with both Paris Agreement’s mitigation and equity goals relies on contentious interpretations of distributive justice2,8,10. Scientists, non-governmental organizations and government experts have suggested multiple effort-sharing approaches to derive equitable national emissions allocations2,8,11,12,13,14,15,16,17,18,19,20,21,22. While not all countries use indicators that favour their equity argument in their communication10, a common definition of equity is unlikely to be adopted since countries generally tend to support interpretations of distributive justice that best serve their self-interest and justify their negotiating positions23,24,25,26. Developed countries who committed to take the lead in reducing emissions and mobilizing finance for developing countries4 often submitted NDCs that do not match the concepts of equity that they publicly supported27 and leave the Green Climate Fund poorly funded28. Their NDCs often imply a status-quo in terms of global emissions shares27, while most of the very ambitious NDCs are from smaller developing countries (https://paris-equity-check.org/). That process doesn’t look easy (14 citations on the fourth line!) but their efforts have been helpful for us to this extent: they’ve provided a clear view of the deep water in which we’re floundering, and that gives us a perfect opportunity to persuade our leaders of their folly. No matter what we do—cease all productive efforts or continue as we are—the efforts of other countries guarantee that we will fail. They’re just not trying hard enough. But as well as failing through these NDCs under the Paris Agreement, New Zealand will be beaten merely by the enormous increases in emissions predicted for China, India and other developing countries. They’re planning hundreds of new coal-fired power stations, exploring and drilling for oil they desperately need for their growing populations, and all the thousands of elements in their burgeoning infrastructure will contribute massively to increased emissions. are destined to overwhelm all other human emissions for twenty and more years. Not just ours but the whole world’s. Meanwhile, the temperature’s not rising much, the sun is cooling and there are strong predictions from multiple sources of a cool phase in the climate. But that’s a whole other story. All the lives saved, improved and lived in greater abundance due to Mother Nature’s miraculous gift of her ancient hydrocarbons, not to mention the human intellects that create from them products of surpassing utility, give us every cause to continue using them. To abandon exploration for hydrocarbons is to select insanity. To ban hydrocarbons is to kill babies. From The Guardian comes this account of the paper. The Guardian seems to approve of unelected European bureaucrats endangering sovereign UK power supply arrangements, doesn’t mind power prices going up because of this failure and likes to close “old dirty power stations” even when it means turning the power off. If anything is to shove true Brexit back onto the rails, this timely interference by the European despots might just be it. Over a year ago we heard of hundreds of coal-fired power stations in the works by China and India. Here’s a reminder of nearly 2000 of them from WUWT. There were 1892 planned, including 27 in Europe, lauded as the home of the anti-coal-to-save-the-earth-movement and forget the families losing their income. The map is clearly BS. Why is Brazil only shaded a light amber? They have chopped-down and burned over 750,000 sq km of amazon rainforest (which must represent about a quarter [?] of all anthropogenic CO2 emissions in the industrial era.) But they merit only a light amber card? JCN above – you may underestimate the rate of regrowth shown by Brazilian Tropical forests. The Brazilian rainforest doesn’t regrow! It is permanently converted into cattle grazing land. Where does all that Brazilian corned-beef come from? JCalvert. The Brazilian census shows increasing forest cover as some clearing is let back into forest. Or I would not have made the claim. Grassland and forest have similar carbon sequestration rates. But grass puts it into the soil as humus, while forests hold most above ground. For a while….